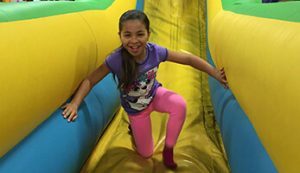 Jumpin’ Jamboree is a fun-filled indoor inflatable playground that you and your children will love! We can provide your children with endless hours of fun! Whether you are bringing your own children or an entire group, Jumpin’ Jamboree can accommodate. We offer special rates for field trips and groups with 10 people or more. Whether you are bringing the neighborhood kids to Jumpin’ Jamboree for an afternoon of fun or your school is planning a special field trip, we can provide you with group rates that you will love just as much as the kids! *Group lunch option only valid for reserved weekday field trips. Whether you are planning a fun field trip for your class of daycare children or you want to bring a group of kids to play at Jumpin’ Jamboree in Doral, we can help! These group rates make it easy to bring a group of children to enjoy our inflatable playground. Before you come in with your group of children or on your field trip, make sure to contact us first! All groups are required to make a reservation ahead of time to ensure we have space available for your group of excited kiddos. If you are planning a field trip, you may want to contact us a few weeks in advance to ensure you get your spot reserved. Contact Jumpin’ Jamboree in Doral with any questions you may have about our special rates for groups and field trips!